From a humble country lodge to one of the most luxe estates in the Irish countryside, which then became an enchanting Benedictine abbey and school for girls — Kylemore Abbey in Connemara in Co. Galway has had an incredible history. The stunning estate and walled gardens are one of the top places to see in Ireland — find out why with this complete guide to Kylemore Abbey. Kylemore became the magnificent castle that it is today because of Mitchell Henry, a wealthy doctor from Manchester who built the estate after inheriting his father’s cotton fortune. Mitchell fell in love with the area after bringing his beloved wife, Margaret, to Connemara in the 1840s – during the Irish potato famine. Even in the midst of such a challenging time, the Henry’s were convinced of the potential to develop this wild part of Ireland. Construction began in 1868 and the glorious result was a 33-bedroom castle, complete with a ballroom, four sitting rooms, a library, a study, many offices, and a fully stocked kitchen, all set on 13,000 acres. The large Henry family would regularly arrive from London to enjoy their luxurious country retreat. Tragically, Margaret Henry died suddenly while on vacation in Egypt in 1874, not long after the castle was finished. Mitchell had her body brought back to Connemara and began to build the neo-Gothic Church where the couple now rests together. The Henry family sold Kylemore Castle in 1902 to the party-loving ninth Duke of Manchester and his exceptionally wealthy American wife. The couple completely redecorated the castle until they ran out of money. That is how the building and its grounds stopped being Kylemore Castle and became Kylemore Abbey. In 1920, a group of Belgian Benedictine nuns fleeing World War I founded a new abbey inside the castle in the quiet Connemara countryside. The nuns went on to open a renowned school for girls, which only closed in 2010. Today, many parts of Kylemore Abbey are open to be enjoyed by the public. Kylemore Abbey is a fantastic place to explore because there is so much to see on the grounds. The site is made up of the estate itself, the Abbey building (castle), the walled gardens and the Gothic church. 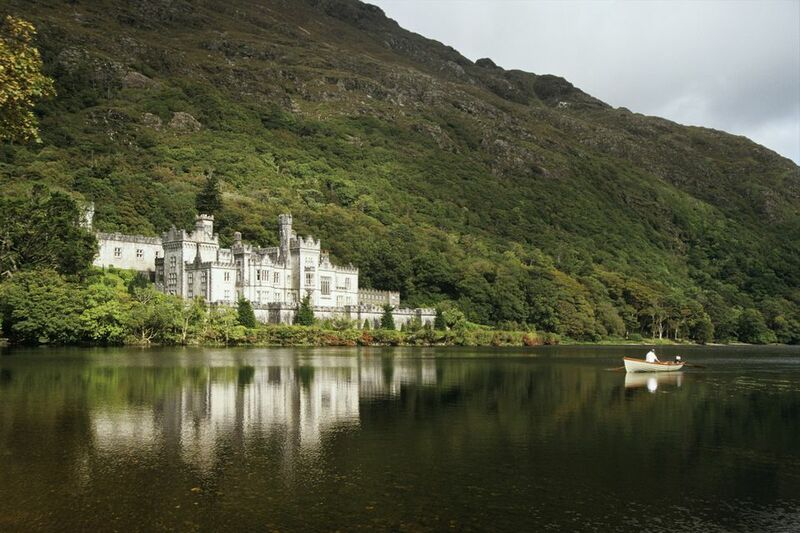 The most striking feature of Kylemore Abbey is the castle itself. First built as the stunning home of Mitchell and Margaret Henry, the castle is nestled into the green Irish countryside and perfectly reflected in the waters of the lake in front of the incredible 19th-century home. The ground floor rooms have been carefully restored to showcase what life would have been like at the estate during the time when it was built. The upper floors of the castle are the still in use as an abbey by the Benedictine nuns who own and live on the property and are not open to the public. The walled garden was created at the same time as the castle and has been considered one of the best Victorian gardens in Ireland. When the Henry’s called Kylemore home, the six acre gardens had a staff of 40 gardeners. Today, the walled garden has been restored by the Benedictine nuns who now own Kylemore and features plants that would have been grown here 150 years ago. There is a formal flower garden, carefully landscaped greens, a vegetable garden and a charming house which once belonged to the head gardener. Leaving the Abbey, the neo-Gothic church is a few minutes’ walk away along the waters of Lough Pollacapull. The small church is designed to look as though it was built in the 14th century, with an arched interior and Gothic façade. However, the miniature cathedral was actually constructed by Mitchell Henry in the late 1800s as a monument to his wife Margaret after she died during a family trip to Egypt. Margaret and Mitchell Henry are both buried in the humble brick mausoleum which can be found just beyond the small church. The surrounding estate is full of nature walks through woods and along the shores of the lake. You can also book ahead to follow a guided hike into the Connemara hills behind the Abbey by calling +353 95 52001. After exploring all Kylemore Abbey has to offer, you can stop for refreshments at Mitchell’s Café, a dining room located on the grounds. Visiting Kylemore Abbey requires a ticket, which can be purchased on the spot or online. The attraction is open every day from 10 a.m. to 5 p.m. The castle at Kylemore Abbey is undergoing refurbishment through mid-2019, which means that some areas may be temporarily closed. During the construction to upgrade the visitor’s center and restore different rooms, a discounted admission price will be applied. The abbey is located near the town of Clifden and the Letterfrack Village. There are occasional buses which go to both of these locations from the main Galway bus station, but Kylemore Abbey itself is still lies about 2 miles beyond Letterfrack, or a 20-minute drive from Clifden. The best way to reach Kylemore Abbey is to self drive by car. It is just over an hour from Galway City, following the N59 towards Clifden. Several private Connemara day tour companies also offer bus tours which include the abbey as a stop. The buildings and history of Kylemore Abbey are enchanting, but part of what makes the estate so mesmerizing is the location in Connemara. This part of Ireland has incredible natural beauty and when you are in the area, you should certainly plan to also visit Connemara National Park. The wild oasis is also located just outside of Letterfrack. Also nearby is the lovely village of Lennane, which sits at the mouth of the Killary Fjiord. The waterfront setting of the tiny village makes for a beautiful photo stop and its compact size makes it easy to explore.